Or Galentine’s day! This year, my girlfriends and I are getting together for a potluck. I plan on making some pizza and some goodies from the list below. So, if you’re getting together with your sweetie, friends, or it’s just you and and a glass bottle of wine, here’s a list of some of my favorite delicious in a dash recipes you can easily whip up this weekend. Share your love with food! 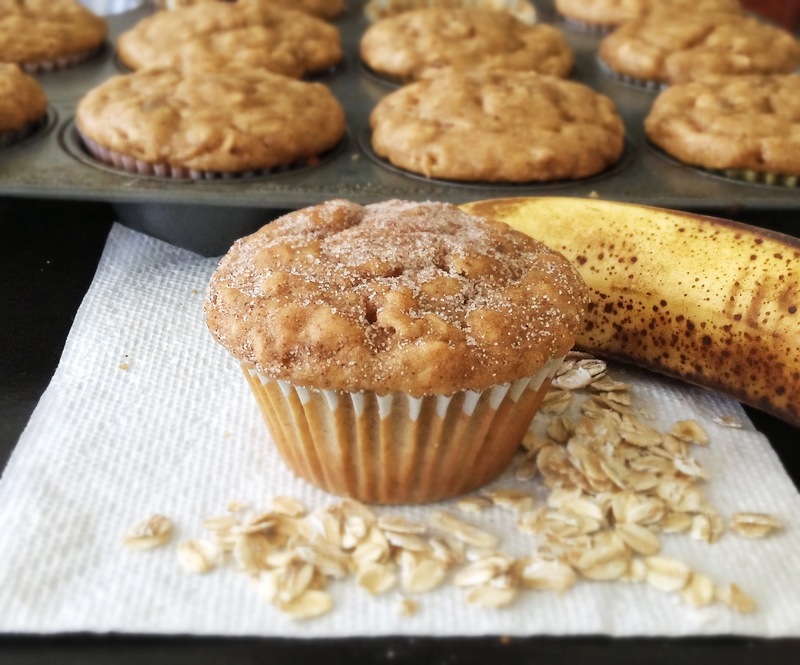 Looking for a breakfast treat? 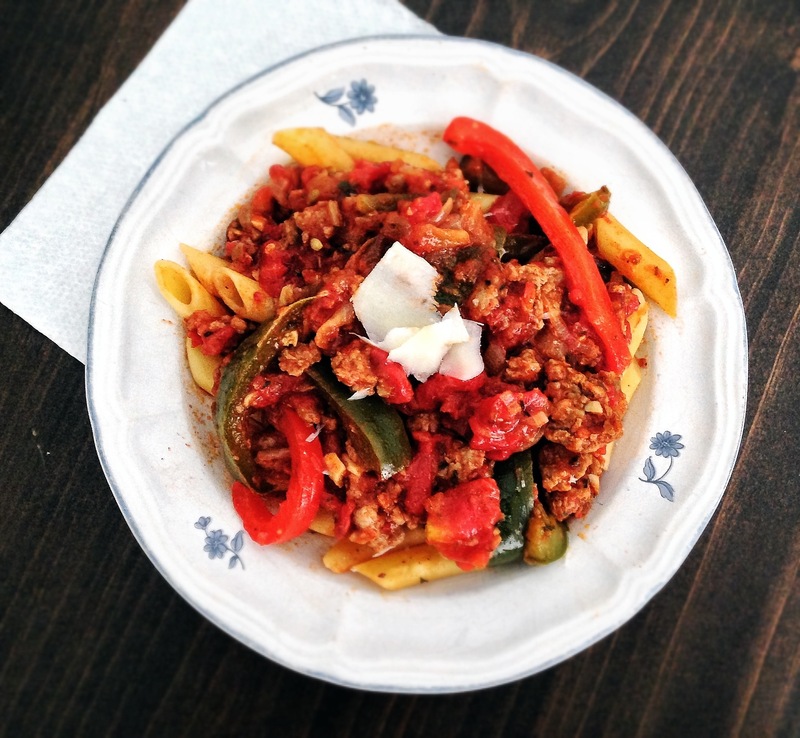 A hearty sausage and pepper pasta – a perfect winter meal. Especially enjoyed when eaten after shoveling feet of snow after successive Nor’easters. 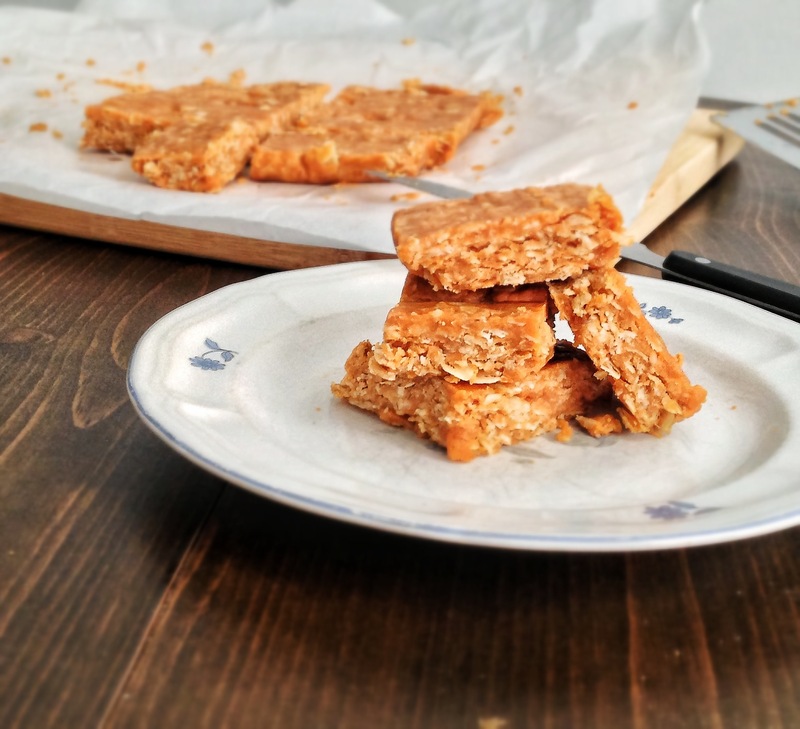 No-Bake Butterscotch Oatmeal bars. No oven needed – whip these up in no time at all! Super chewy and never flat. You can make a few cookies and freeze the extra dough for later. 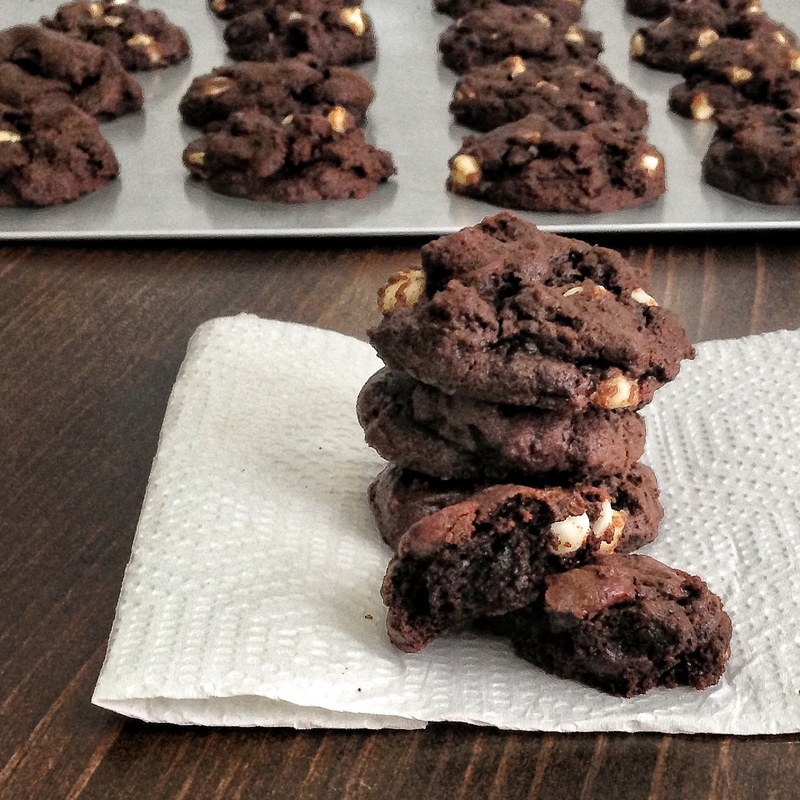 For the chocolate addicts in your life: Chewy Triple Chocolate Cookies. These are for chocolate lovers and must be accompanied by a big glass of milk. A rich, chewy, and decadent cookie cake. Made in 35 minutes flat – from prep to your plate or belly. Gooey, chocolatey, cookie buttery cake. With an easy Biscoff caramel on top. Yep. Biscoff caramel. This is the ultimate. Why is this the ULTIMATE? Because it is just so damn good. 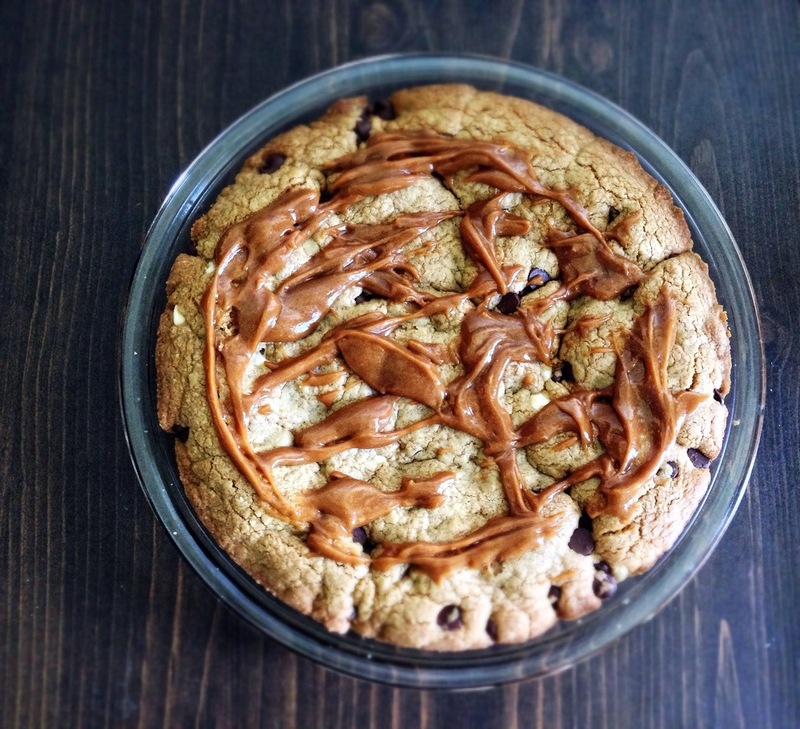 When you bite into this cookie cake you’re going to say “Wow” but it will sound more like “Mow” because your mouth will be full of chocolate goodness and gooey Biscoff caramel. That was the reaction I got when my coworkers devoured this cake and again when I brought this to my future mother-in-law’s house, then to a friend’s graduation party and then again to a family BBQ. Many of them asked for the recipe, so I decided to triage this cake to the top of the blog roll. In the past 3 weeks, I have made this cake FOUR times. It really is incredible how chewy and rich this cookie cake is. And drizzled (or smothered) with a Biscoff caramel on top. Moist, chewy, chocolately goodness. And, it is SO simple to make – I will show you step by step how simple this was. Don’t take my word for it. Just scroll down. WELL, let me tell you, that this cookie cake is about solve all your problems. ALL of them. Because that’s what cookies are. Problem solvers. This cookie cake is faster than baking individual cookies (no dropping dough on a pan, or chilling dough), it is faster than baking a cake (no mixer required! ), it is faster than blondies (no hour + cooling time needed). And, if I haven’t mentioned, it is so damn good. 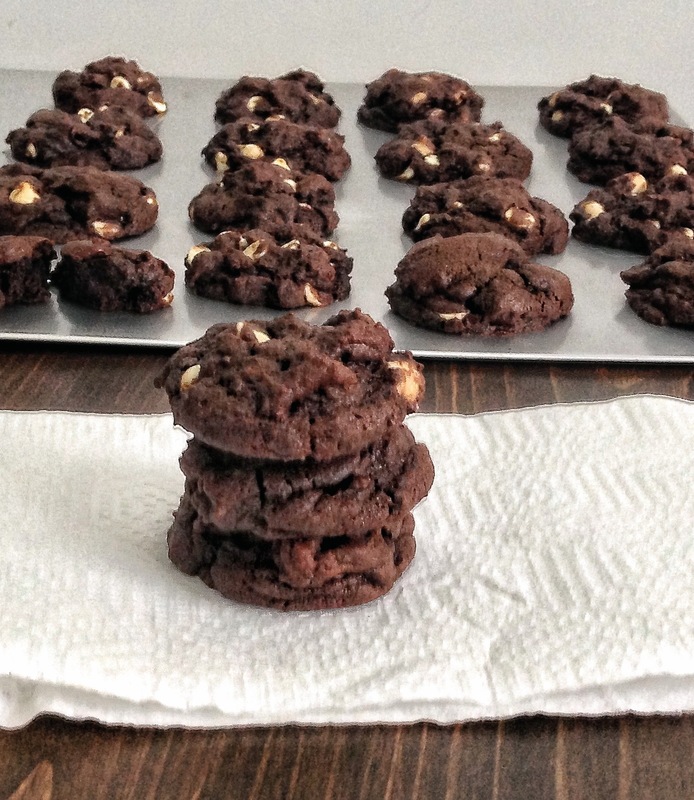 Chewy, chocolate, cookie goodness. It is so moist, and so chewy, it is the ultimate cookie cake. 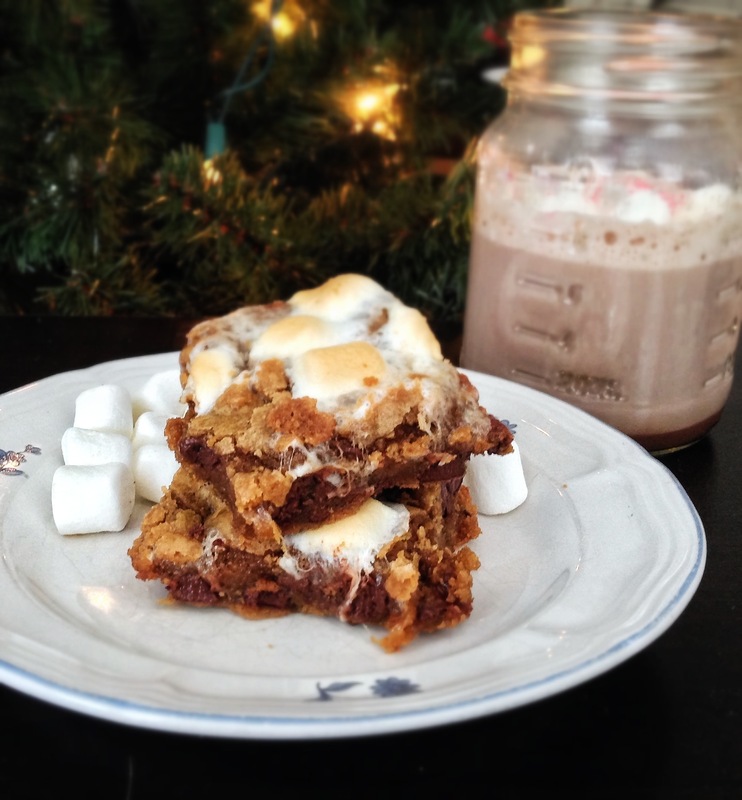 If you like chocolate chip cookies, and you like blondies, you will LOVE this cake. 6. Fold flour until well incorporated. 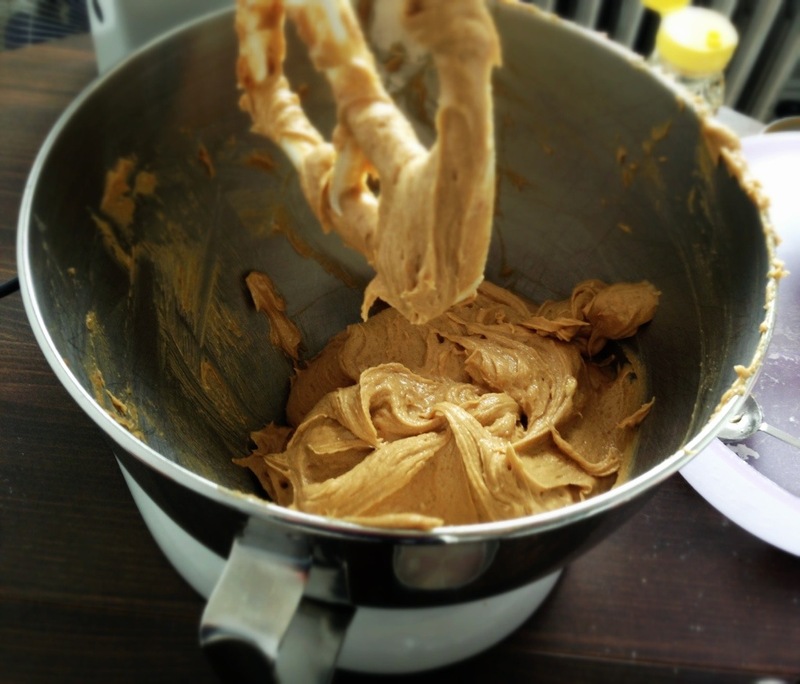 The last step is to make your Biscoff Caramel Sauce. 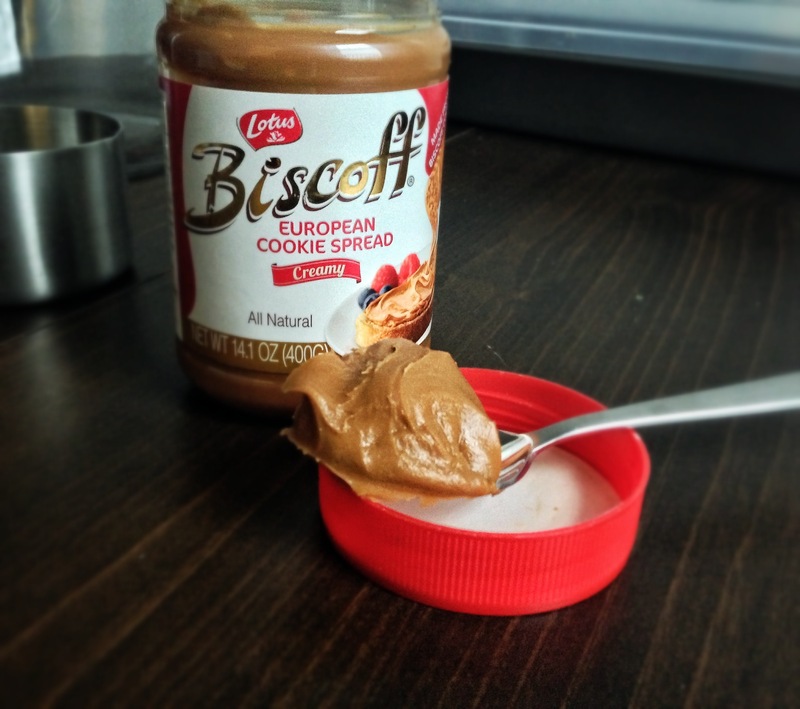 As I’ve stated before: I LOVE Biscoff – it is the most delicious thing that comes in a jar. So why not smother the top of this cookie cake with some extra Biscoff love. The caramel sauce is made with just equal parts milk and Biscoff stirred together until smooth. This makes a creamy drizzle on top of your cookie cake. You can alter the ratio to get a thicker or thinner caramel on top. I made it with both a 1:1 and a 1:2 milk to Biscoff ratio. The 1:2 ratio yields a thicker caramel (see left bottom pic) which makes it difficult to drizzle (compared to the 1:1, the bottom right pic) But I honestly loved it both ways. Can’t decide? Heck, just make it all 4 ways. 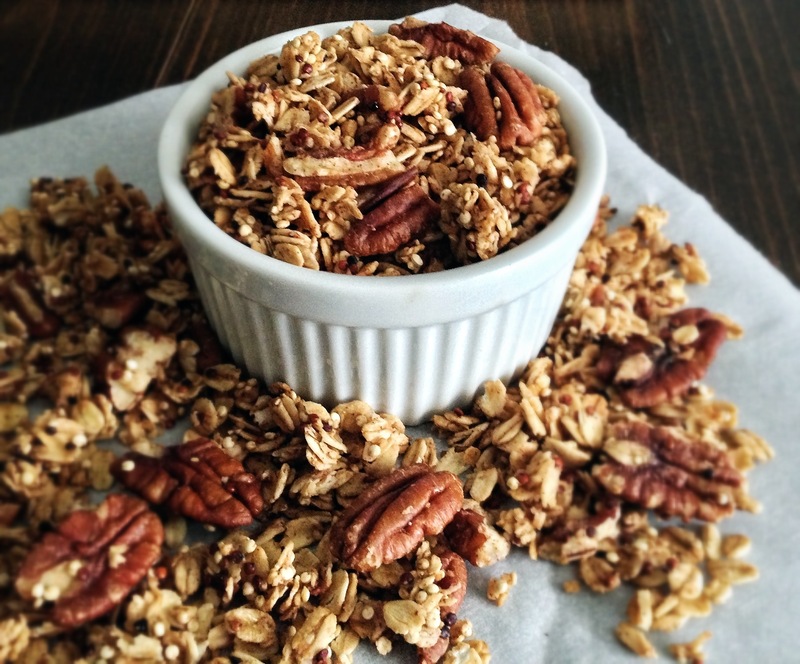 Also, try some Biscoff caramel in your morning oatmeal – shhhh I won’t tell. Preheat oven to 350 degrees. Grease a 9-inch round pie pan. In a small bowl, combine the flour, salt, baking soda and baking powder. Stir to mix everything and set aside. Melt butter in microwave, just until there is a small piece of unmelted butter left. In a large bowl, stir melted butter and brown sugar until well combined. Then add in the Biscoff and mix until well incorporated. Next add the egg and egg yolk and vanilla and stir until everything is well combined. Add the mixed dry ingredients into the large the bowl with the wet ingredients. 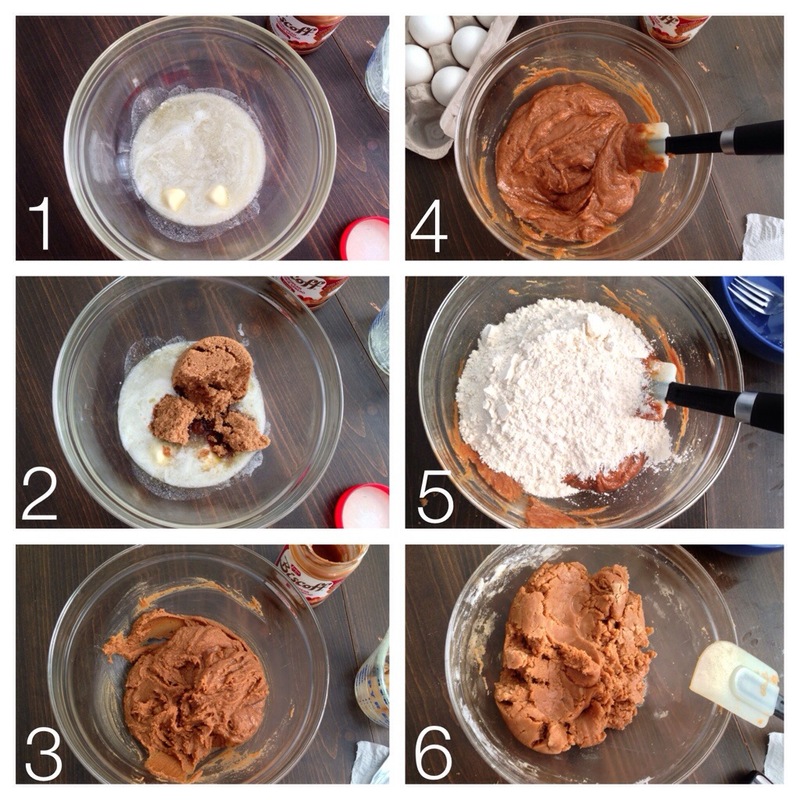 Fold the flour mixture into the Biscoff mixture using a spatula until well incorporated. This may take a minute because the wet ingredient mixture is thick, but keep folding, everything will go in. 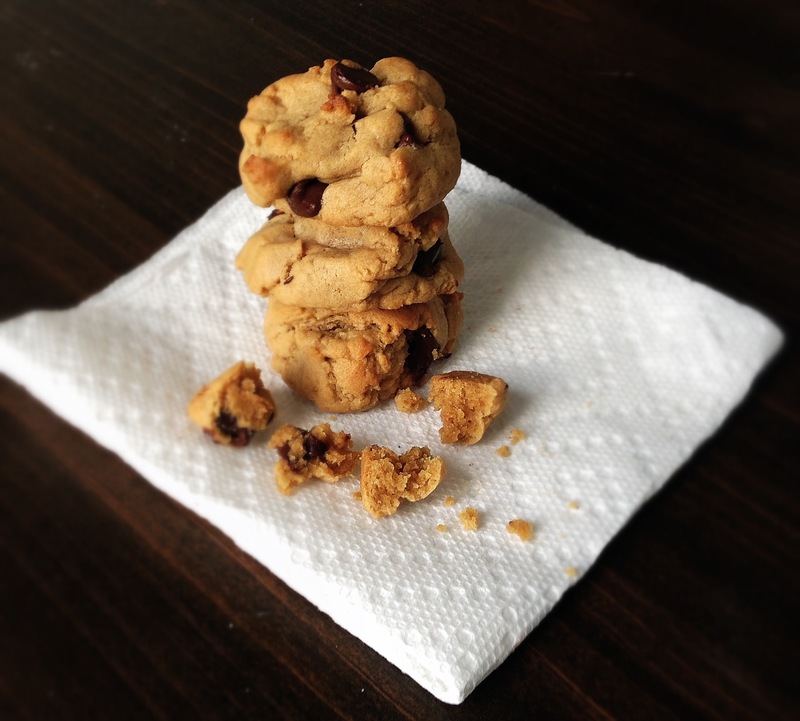 Fold in the chocolate chips. Then dump it into the prepared pie plate and pat down using your hands to make an even layer. Bake at 350 degrees F for 20-25 minutes or until cookie is light golden brown on the outer edges. 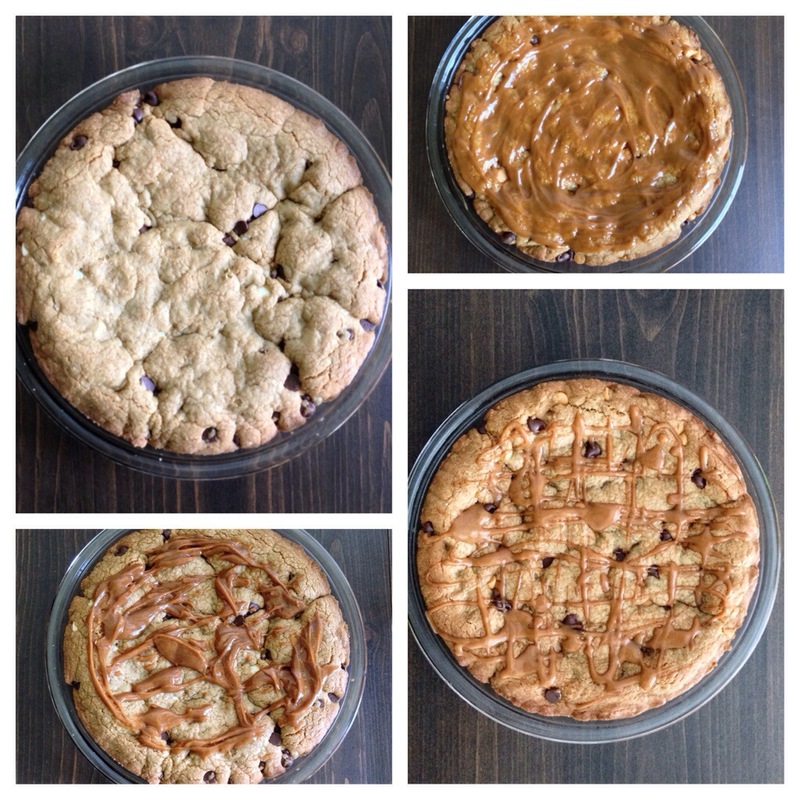 Allow cookie cake to cool about 10 minutes. While cake is cooling, in a small bowl, stir milk and Biscoff until well combined. This may take a minute or so, just keep stirring. If you would like a thicker caramel to spread, use only 1 tablespoon of milk. Drizzle or spread Biscoff Caramel over cake. 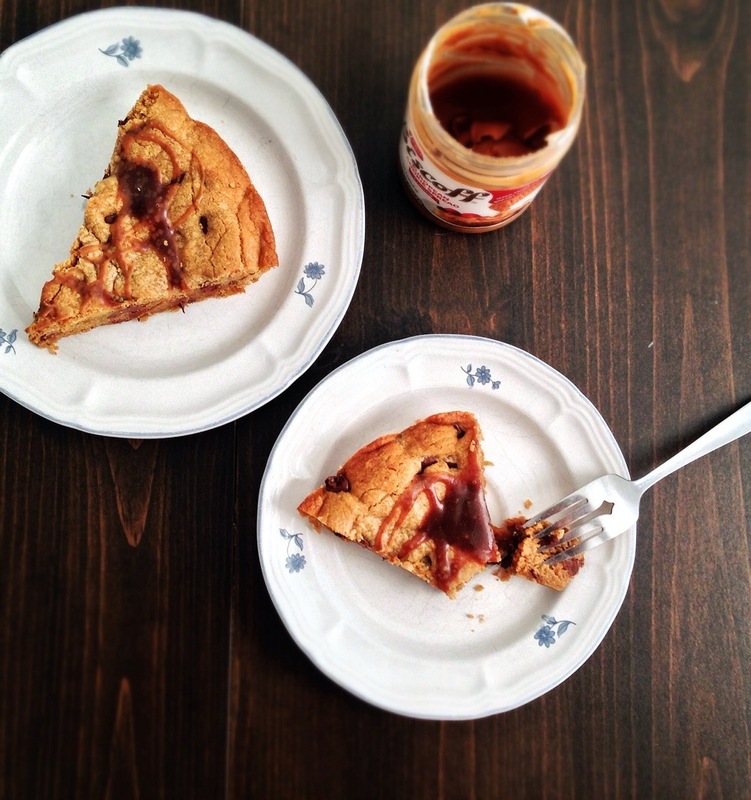 Serve directly from pie pan and enjoy! Happy Valentine’s Day! Time to mix it up with a sweet treat! I LOVE s’mores. They’re gooey and chocolatey. The flavor combination of marshmallow, chocolate and graham is one my favorites. I’ll eat anything s’mores – s’mores ice cream, s’mores cake, s’mores candy, s’mores cereal (remember Smorz?! )… you get the idea. There is just something about toasty marshmallows, melty chocolate and graham cracker that just make the perfect dessert for me. MMMmmm! 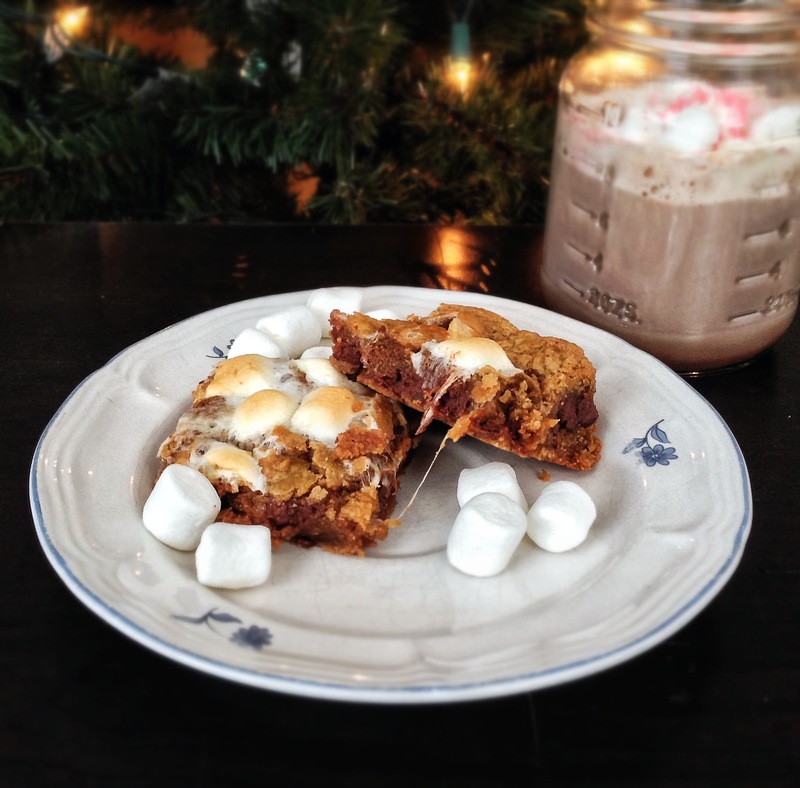 My mouth is watering just thinking about these cookie bars! These bars are made with Biscoff spread, aka cookie butter. If you have never tried Biscoff, it is a creamy spread made from Belgian Biscoff cookies – which are shortbread cookies that have a hint of graham taste mixed with a little cinnamon. I know this sounds weird, a creamy spread made from cookies, but it’s not. It’s the most delicious thing that comes in a jar, which is why I had to make some treats with it. 1. To make a DELICIOUS dessert 2. To use it up so I wouldn’t keep eating it straight out the jar with a spoon. ACK! I usually have pretty good self control, but this is my kryptonite. Seriously. And if you’re wondering, yes, I ate this whole spoonful after I took the photo. These bars are so great not only because they’re SO moist, chewy, toasty marshmallow-y and chocolatey, but because they’re super simple to put together! No mixer is needed! AND, unlike standard S’mores, no individual serving assembly required – No fighting over the fire to roast your marshmallows and no sticky fingers. You’re welcome. Definitely Delicious in a DASH! 1. 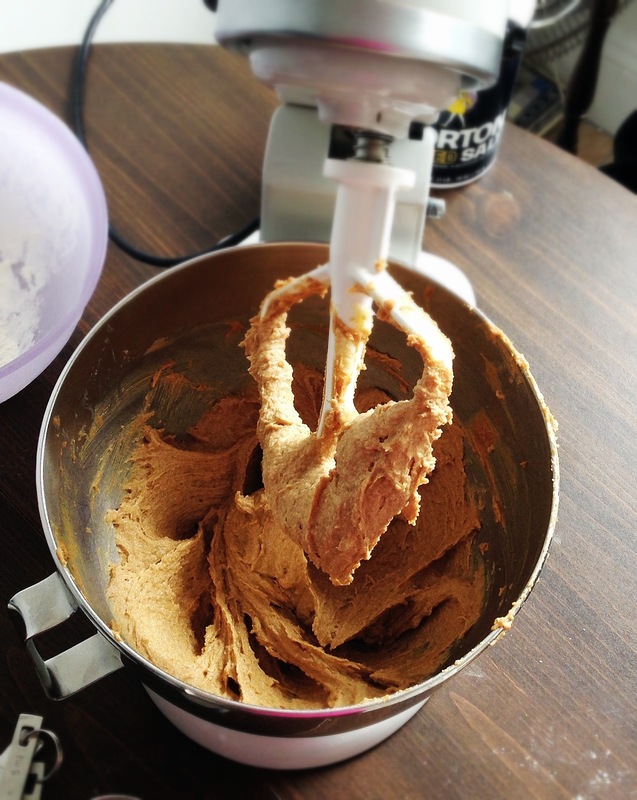 Combine all the wet ingredients and then stir in the Biscoff spread (Cookie Butter) 2. Add in the dry ingredients and 3. Fold in until well combined 4. Add in the chocolate chips and marshmallows 5. Toss it all in a baking dish lined with parchment paper 6. Smoosh it down and throw a few more marshmallows on top. Then pop it in the oven – and you are 25 minutes away from Heaven. Make this for your sweety for Valentines Day. Or better yet, Treat Yo Self! 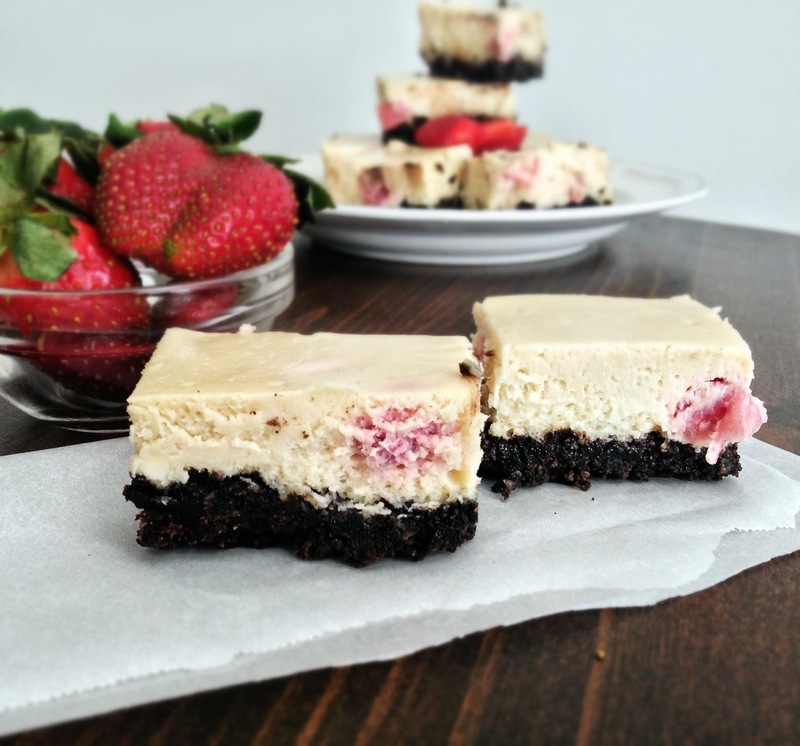 My taller half loves cheesecake – so I made him some special cheesecake bars for Valentine’s Day (stay tuned for the recipe! ), but I’ll be making THESE for myself. 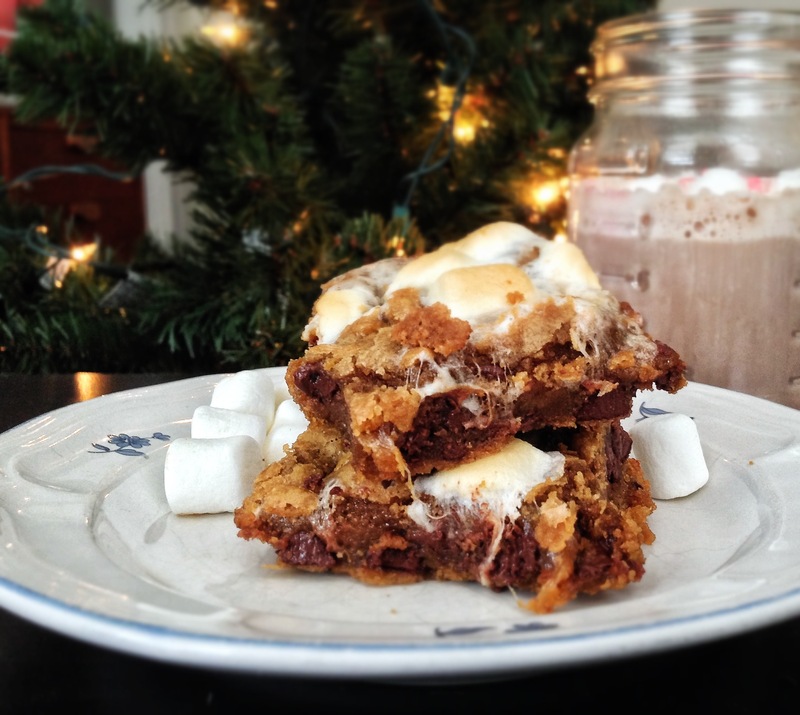 Who says you can’t have a whole 8×8 pan of cookie bars for yourself? 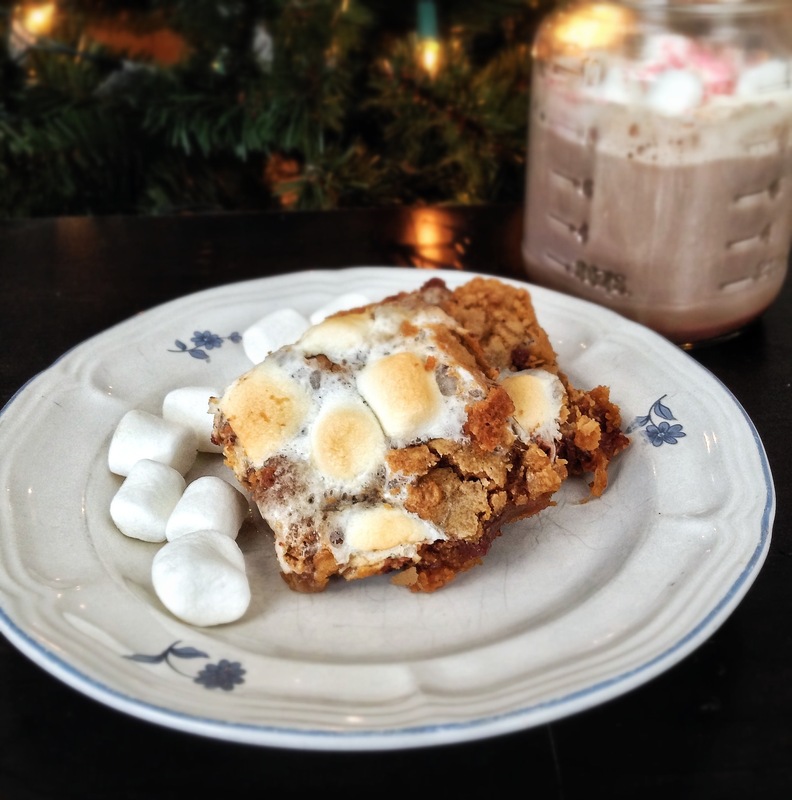 Stretchy, toasty marshmallow, and melty chocolate with a chewy, moist graham center. Yep. 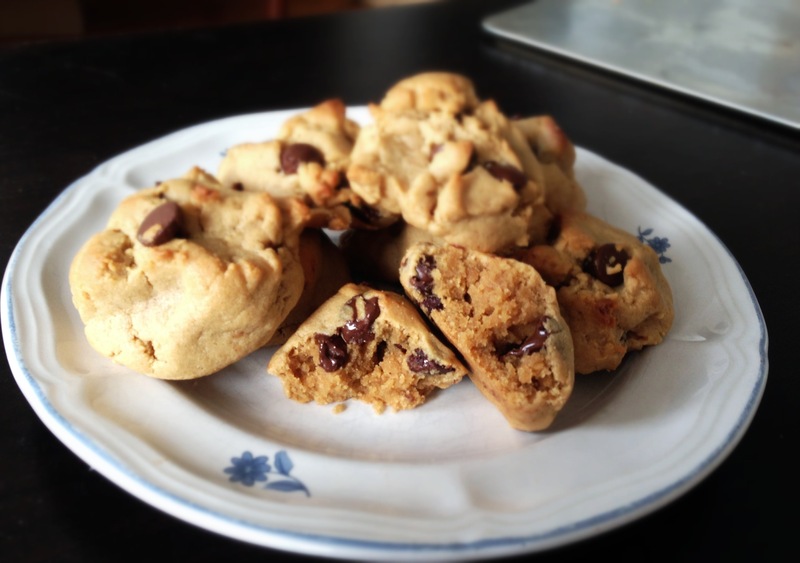 make these for yourself. Happy Valentine’s Day, YOU. Wonderful, Beautiful YOU. Fold the dry ingredients into the wet ingredients. 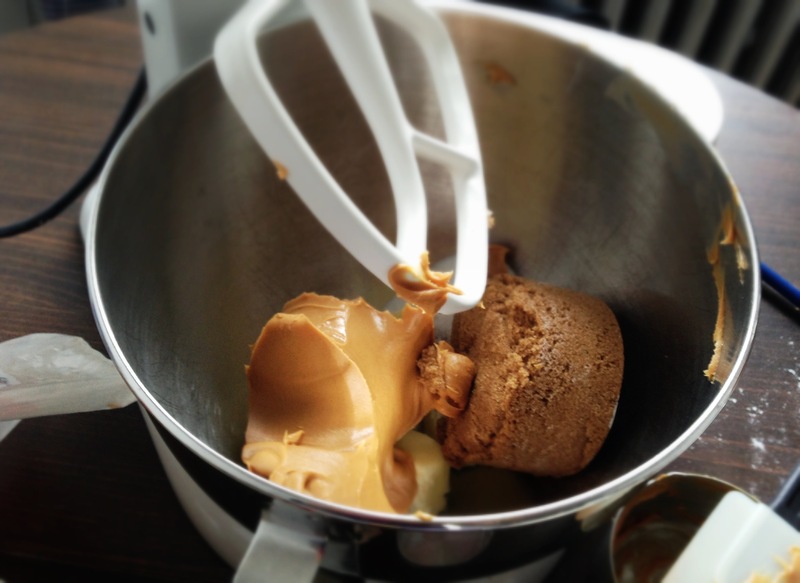 Do not over mix – I usually fold with a rubber spatula to ensure that I don’t overmix. The batter will be very thick. 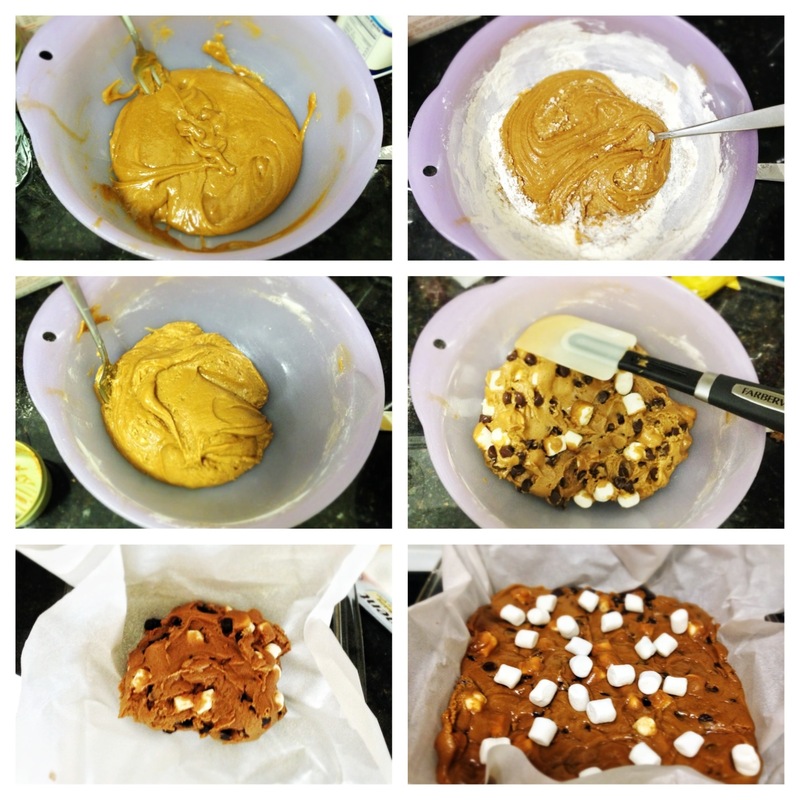 Fold in the chocolate chips and marshmallows and “dump” the batter into a prepared baking dish. Then press down the batter so that it is even throughout the baking dish and top with reserved marshmallows. Gently press down the marshmallows. 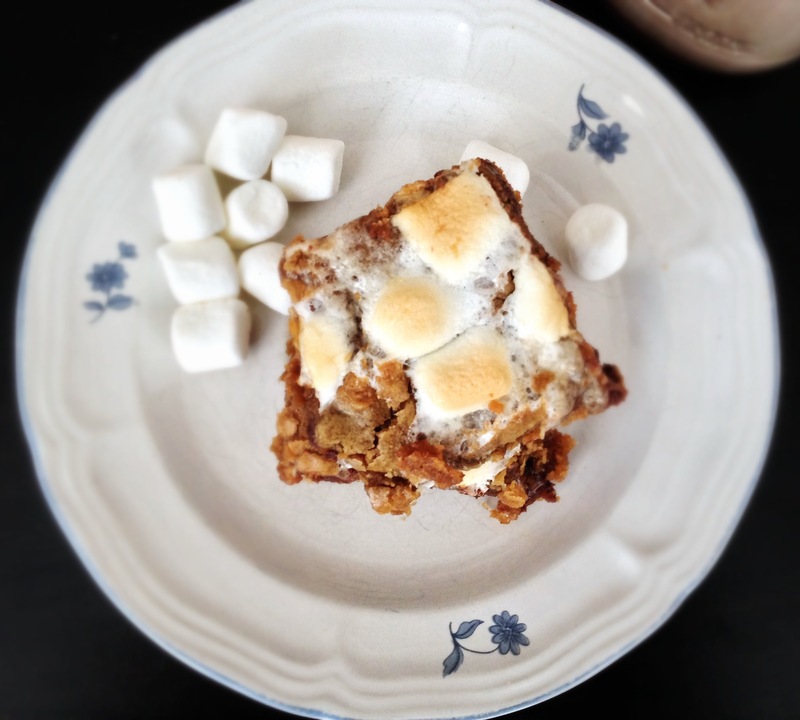 Cookie bars stay fresh for a week when stored in a sealed container at room temperature. This is a chocolate lovers dream. Do you wish you could have chocolate after every meal? Or maybe, INSTEAD of every meal? Do you dream about chocolate while awake? If you answered yes to any of these questions, then THESE are your NEW favorite cookies. 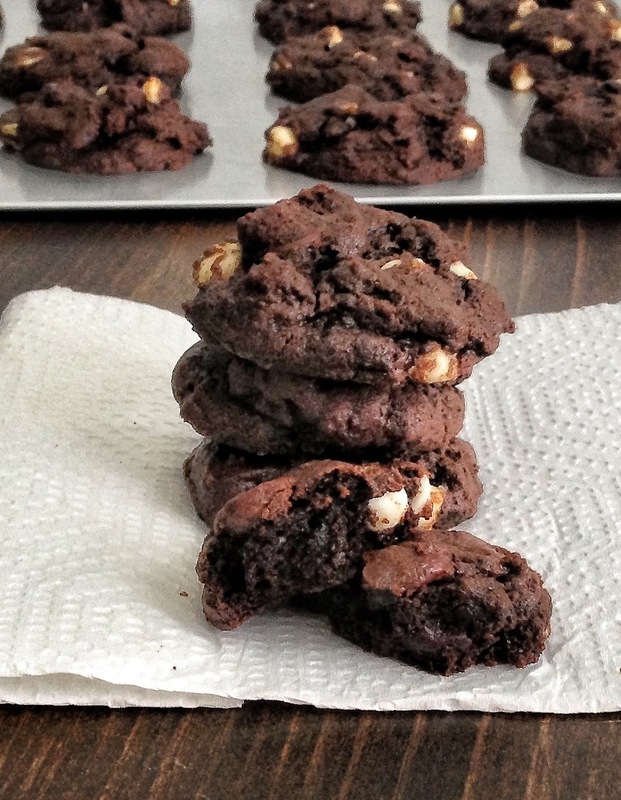 Chewy triple chocolate cookies. 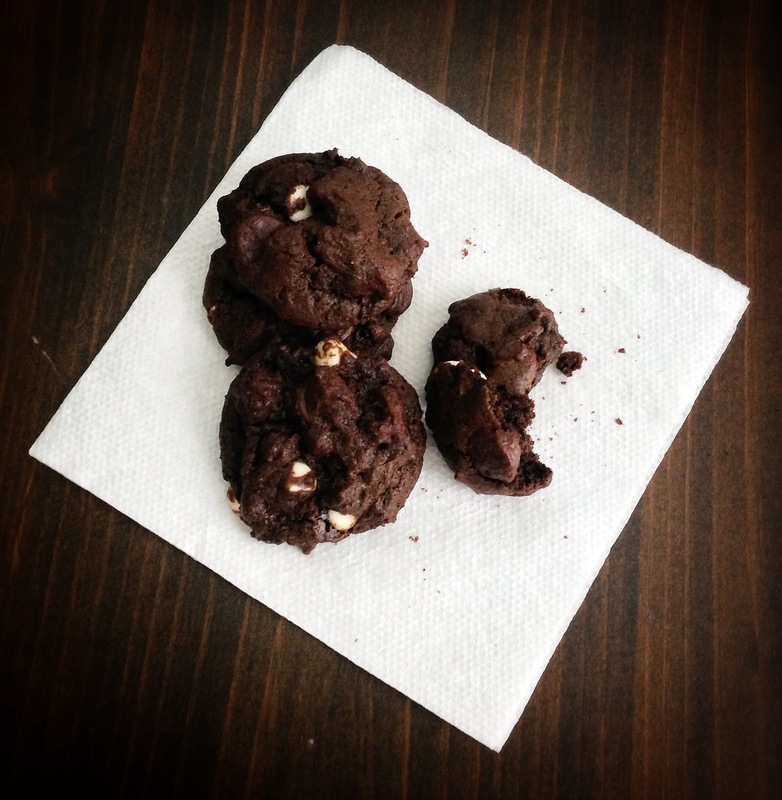 When we all lived in the same state, we enjoyed these really delicious “break and bake” triple chocolate cookies. They were really good, and you could break off just a few and bake them up. The downside of the “break and bake” cookies: they were really expensive. 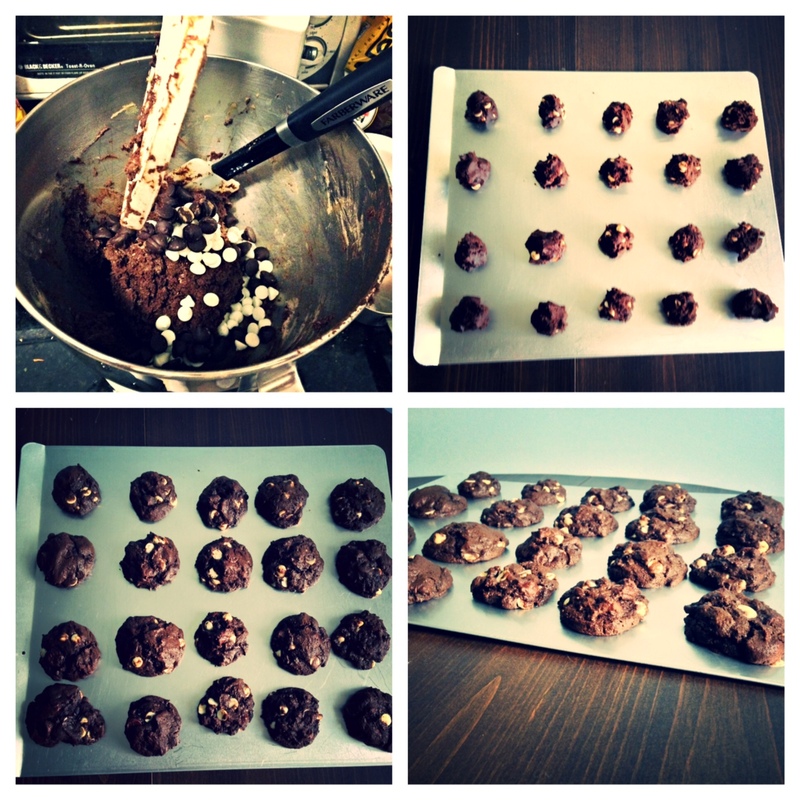 So, back in April, when I was going to meet up with the girls, I went on a mission to try and replicate the cookies. I tested them out on C on our way down to DC to meet K to run the Nike All Woman half marathon in April. 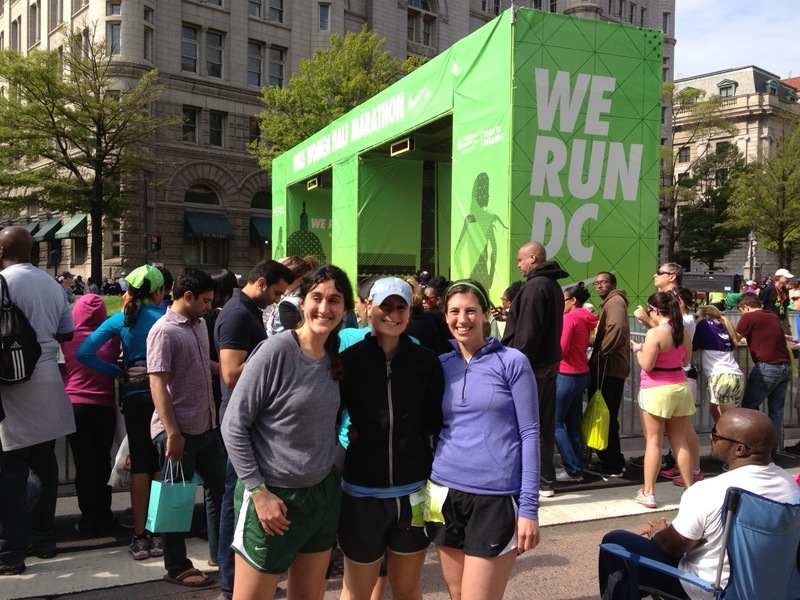 Here we are after the race! 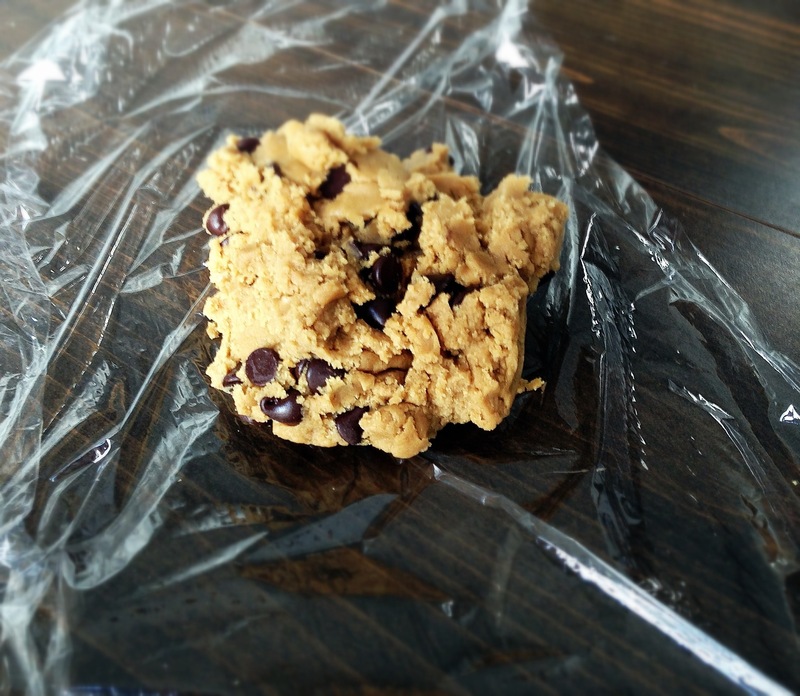 Ok. ok. back to the cookies… C ate them on the plane at 7am (I’m a huge supporter of sweets for breakfast!) 🙂 SHE LOVED THEM. They got a little banged up in the plastic bag, so she proceeded to tip the bag so that the crumbs would fall out and she could enjoy every last bite. Cookie replication success! The secret to these cookies being so chewy is honey! It keeps them soft and chewy for days after you bake them. 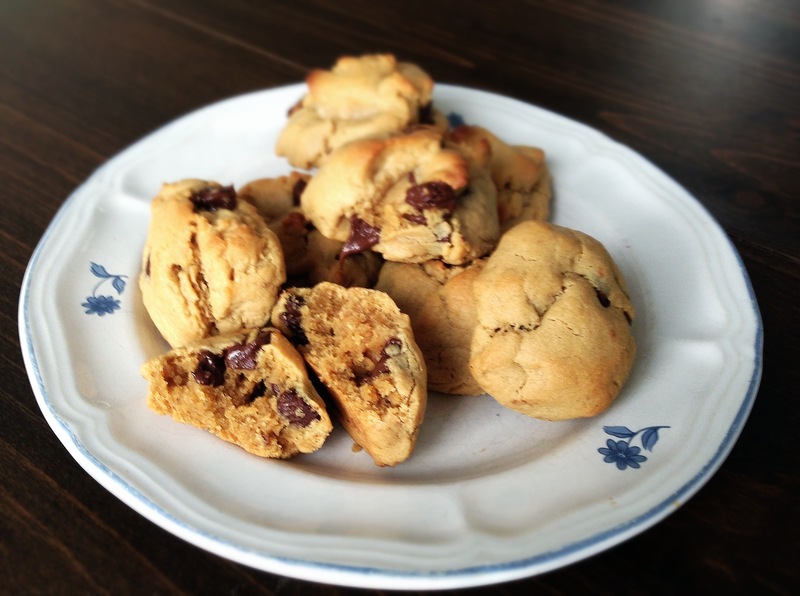 Honey adds moisture to the cookie, even after it is baked – it pulls moisture from the air (to get all science-y on you, honey is hygroscopic), so these cookies are guaranteed to stay soft! 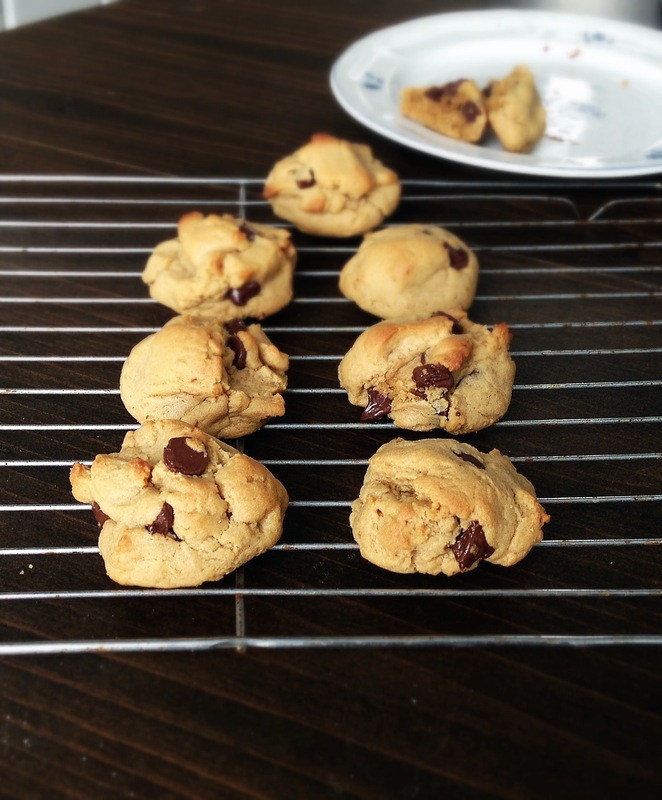 This is based off my Best Peanut Butter Chocolate Chip cookies – which also have honey to keep them soft and chewy. 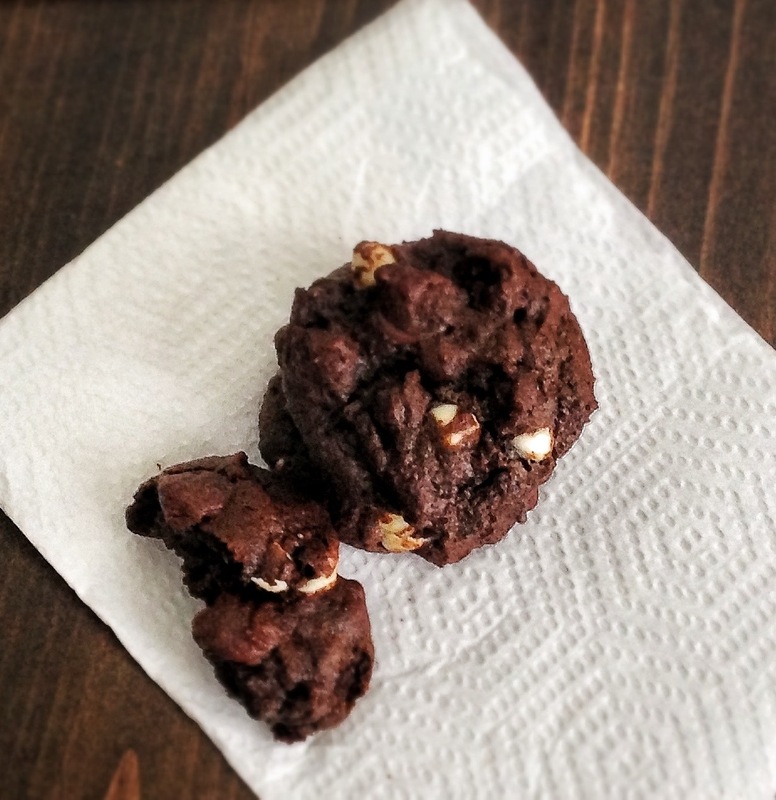 The other thing about these cookies is that they are very, very and I mean VERY chocolatey. They are not too sweet, which is why I added white chocolate chips to them. White chocolate is much sweeter and balances out the cookie. 1. Just as in my Peanut butter chocolate chip cookies, cream the butter/sugar, then add the wet ingredients. I always mix the dry ingredients separately and THEN mix the wet and dry together. I really like doing this because it ensures that everything is mixed prior to combining, that way you don’t over mix your cookie dough. 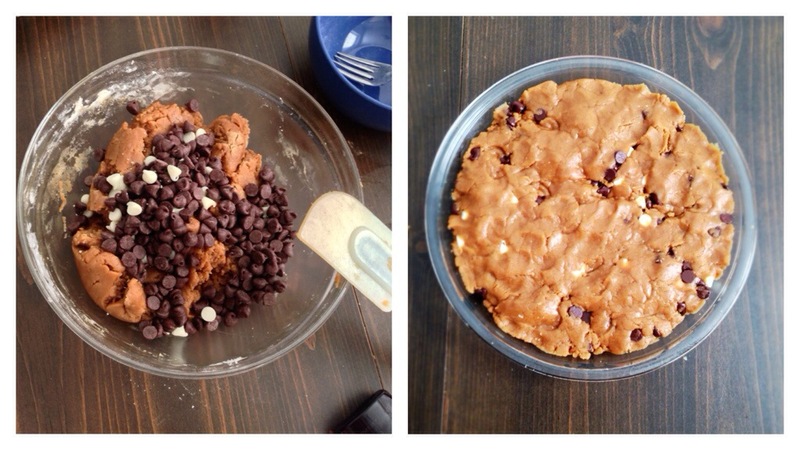 You NEVER want to over mix your cookie dough. 2. This dough MUST be refrigerated for at least 2 hours before baking. The dough must be cold. Two hours might be overkill, but I want to make sure the dough is cold. The chilled dough is sticky, but I promise you, the messy hands you get as a result of measuring out dough onto a baking sheet is WELL WORTH it. Non-chilled dough is impossible to handle (WAAAY too sticky), and the cookies will just bake out flat. blah. flat cookies = sad Liz. I know, I know, this waiting a whole 2 hours totally goes against my “dash” mantra, but you can make the dough ahead and keep it in the fridge a day or 2 or 3 or freeze them until you’re ready to bake them up. To that same mixing bowl, add step 2 wet ingredients *To measure out the honey, use a non-stick cooking spray (like Pam) to spray the tablespoon. The honey will slide right off the tablespoon and you won’t loose any honey. After dough has chilled, roll about a tablespoon of dough into a ball and place on a baking sheet. You can smoosh the cookies with your hands if you like. The dough will be sticky. Bake for 9-11 min. 10 minutes is perfect for my oven and the size I bake, but it may vary based on oven and cookie size. 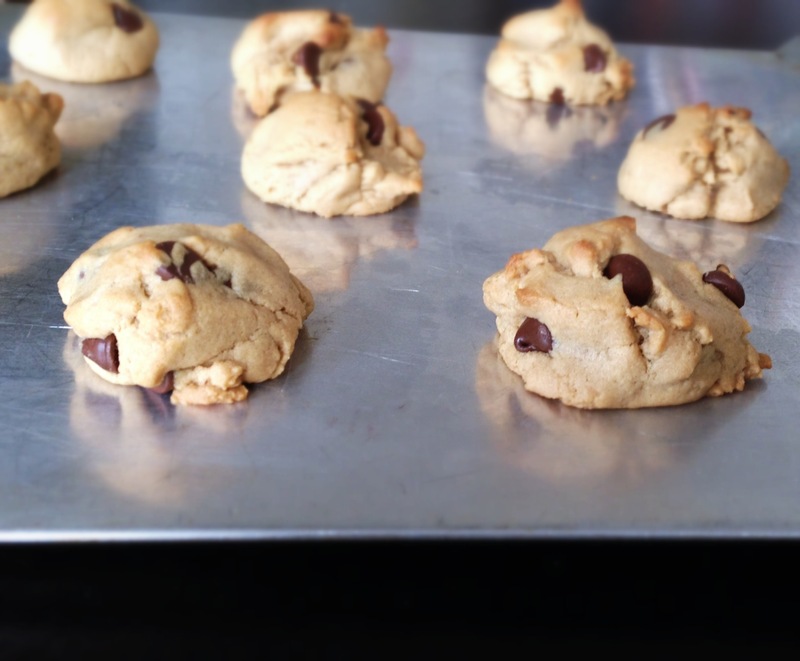 Let cookies cool for about 5 minutes on the baking sheet – then go ahead and DEVOUR them. 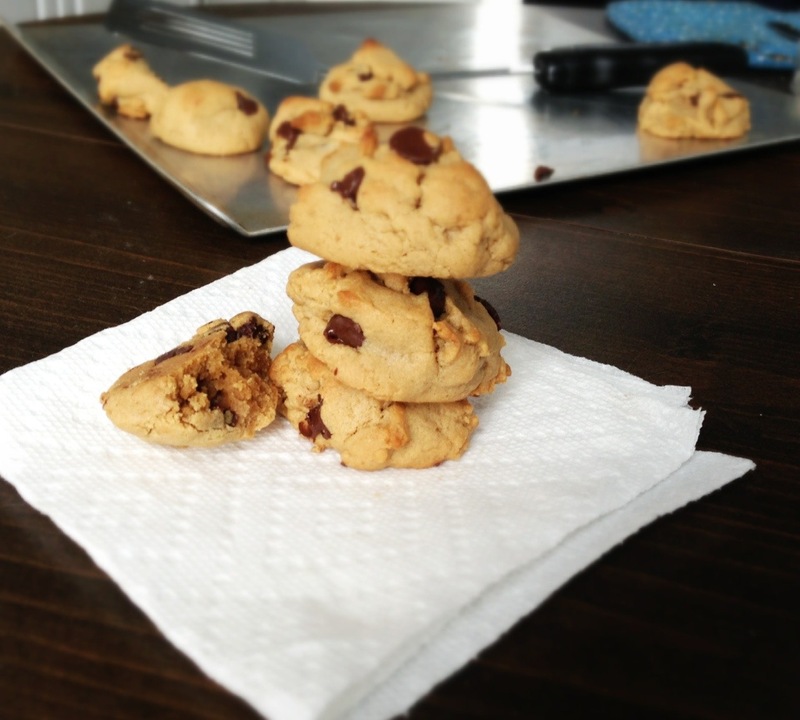 Cookies may look a bit underdone – but that’s ok! They will continue to bake a few minutes after being removed from the oven. If you over-bake them, the cookies will get crumbly. My best friend, Chelsea, defended her doctoral thesis on Friday, and this post is in honor of her. What is her connection with these supposed “Best Peanut Butter Chocolate Chip Cookies, EVER”? Chelsea, is not a cookie lover. You know, she’s the type of person who will choose any other type of dessert over a cookie. Well, ladies and gentleman, this changed after she tried these cookies. She’s actually requested me to make these cookies multiple times AND she nagged me for the recipe. I say nagged, mostly because I took forever to give her this recipe. 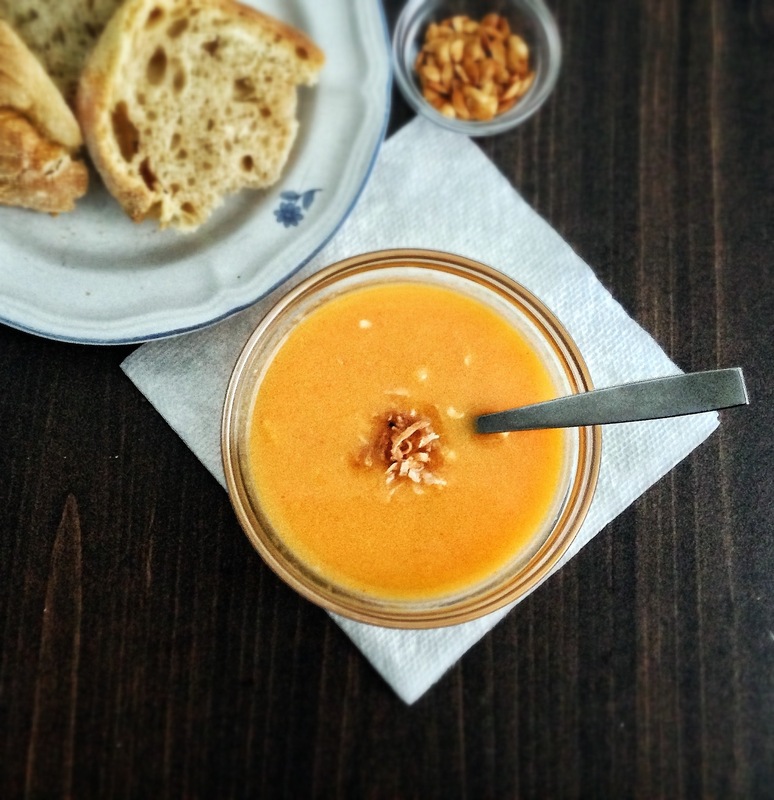 I stink at writing down recipes, which is one of the reasons I started this blog. It forces me to write down my recipes and it makes it easier for me to share them with my friends and beyond! These cookies have clearly changed Chelsea’s life (for the better), and I’m confident they will change yours. What makes these cookies the absolute BEST? 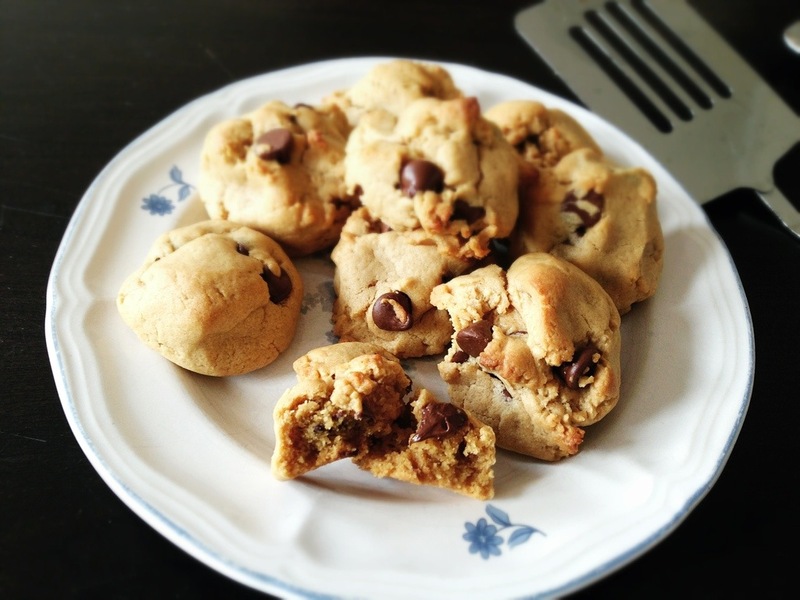 These cookies are super chewy and soft, and they are this way consistently. Look at those beauties. They’re nice and fat. If you like crispy cookies, sorry, these are not crispy. But I do beg you to try these, because I bet you will like them. No. You will love them. They might even convert you to being a chewy cookie lover. Seriously, if you follow my easy recipe – no substitutions, they will come out perfect every time you make them. These cookies don’t flatten and these cookies don’t run. The dough doesn’t need to be refrigerated before you bake them, but you can if you need to. Normally, cookies are a delicate beast, so to be able to say these are so easy to make and hard to mess up?! Well, we have a gem on our hands. Another bonus? The peanut butter to chocolate ratio is perfect and they are not too sweet. I’ve worked really hard to perfect this. *disclaimer: your taste for chocolate/peanut butter may vary. Do you need anymore reasons? OK Ok, I have another one for you. The dough freezes really well. 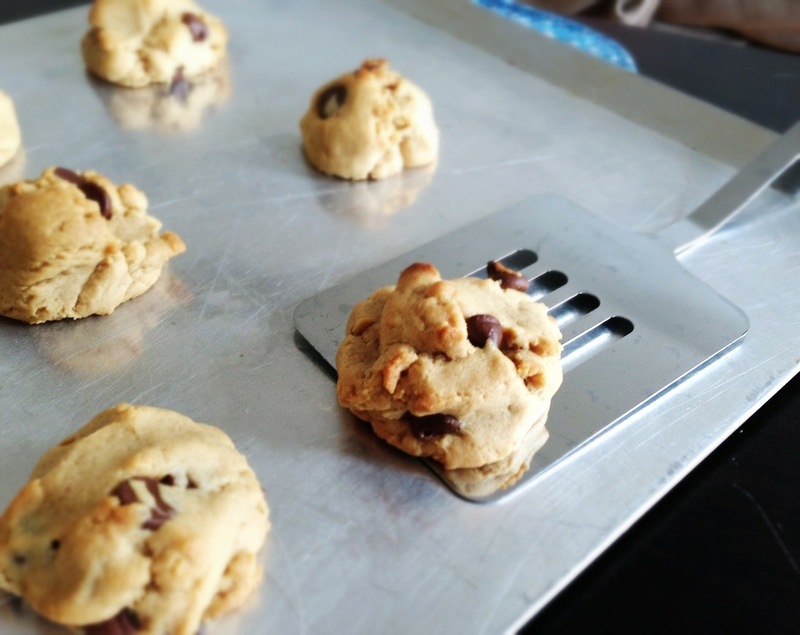 This means you can have fresh baked cookies in under 10 minutes anytime you want. ANYTIME. I guess this can be a pretty dangerous thing. But, eh. Enjoy life. You can whip up a batch and divide it into smaller portions and wrap 2x in plastic wrap and pop it in the freezer. 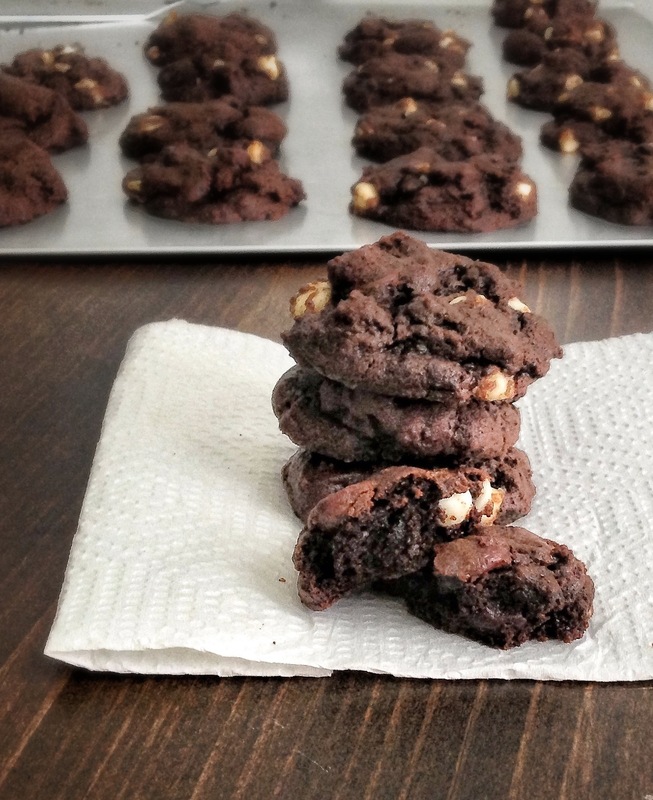 So how do you make these chewy, chocolatey, peanut buttery cookies in a DASH? First, pull out your butter so it can soften at room temperature. You never want to melt your butter, just let it sit at room temperature about 5-10 minutes. While your butter is softening, gather up all the other ingredients and bowls and things. I usually prep my dry ingredients first, because my butter is still softening. In a large bowl, combine the flour, baking soda and salt and set aside. **When measuring flour, be sure to scoop into the cup, and then level off with a knife. You never want to scoop with the cup. It will pack the flour down into the cup and you will measure too much. For more on how to measure flour, check out the King Arthur Flour website. Now tackle the step 1 wet ingredients. I cut the still cold stick of butter into 4-6 pieces, this way, it is easier to mix. **A tip for measuring out the creamy peanut butter – spray the cup with non-stick cooking spray – it will make the peanut butter slide out easier. ** I also have always used Skippy creamy peanut butter with these cookies, but any creamy peanut butter will do. I’ve never tried natural peanut butter with these cookies, (I usually save that for sandwiches) so I can’t guarantee their perfection, however, you can try. Next, combine step 2 of the wet ingredients to mixing bowl that contains the well-creamed butter/sugar/peanut butter mixture. ** Tip for measuring honey. Just like the peanut butter, spray the tablespoon with non-stick cooking spray before measuring the honey. The honey will slide right out. ** Mix all the ingredients till they are well combined. 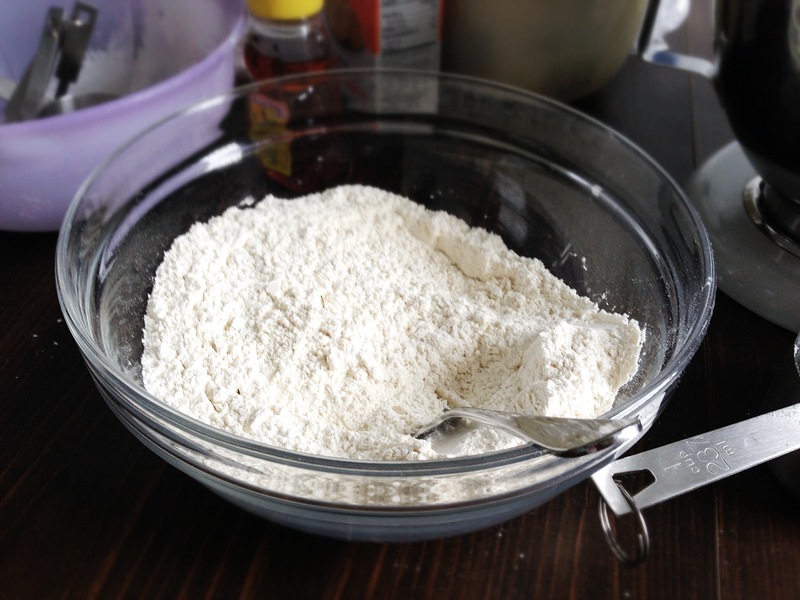 Finally, Add the dry ingredients (flour, salt, baking soda) to the mixing bowl that has the well mixed wet ingredients. I add the dry ingredients in 2 batches – ½ in, stir till combined, then the other ½. Do NOT over mix your cookie batter at this step. To measure out the cookies, I usually use a tablespoon, this is the size cookie that my baking time is for. You can certainly make them larger. You will need to adjust the baking time. These cookies don’t spread, so you can put them closer together than I have pictured here. Now you’re ready to bake. 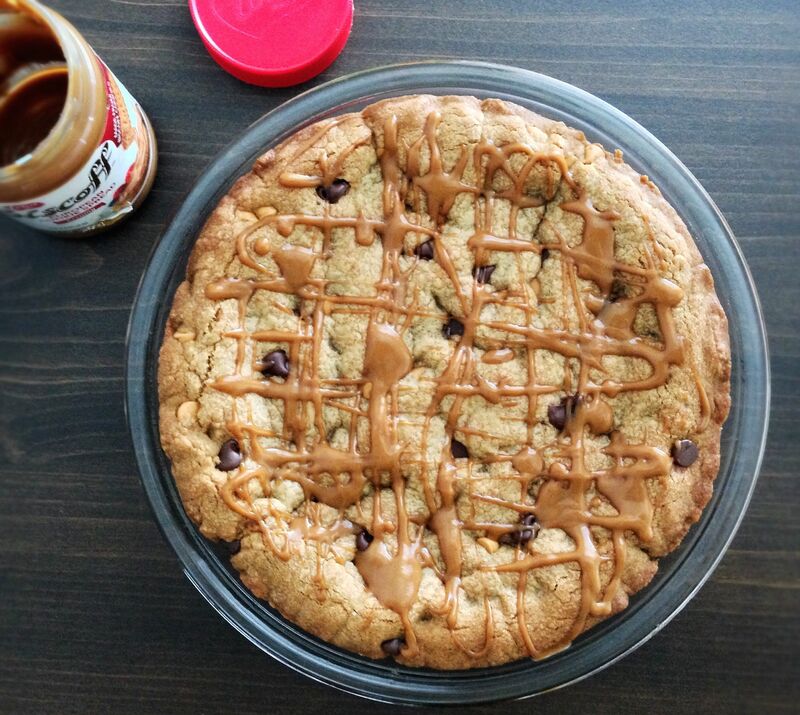 Get ready for peanut buttery, chocolatey deliciousness! Mmmm! Warm, creamy peanut butter and melty chocolate. To that same mixing bowl, add step 2 wet ingredients **To measure out the honey, use a non-stick cooking spray (like Pam) to spray the tablespoon. The honey will slide right off the tablespoon and you won’t loose any honey. Add the mixed dry ingredients to the wet ingredients. You may add the mixed dry ingredients in 2 batches to make it easier to incorporate. 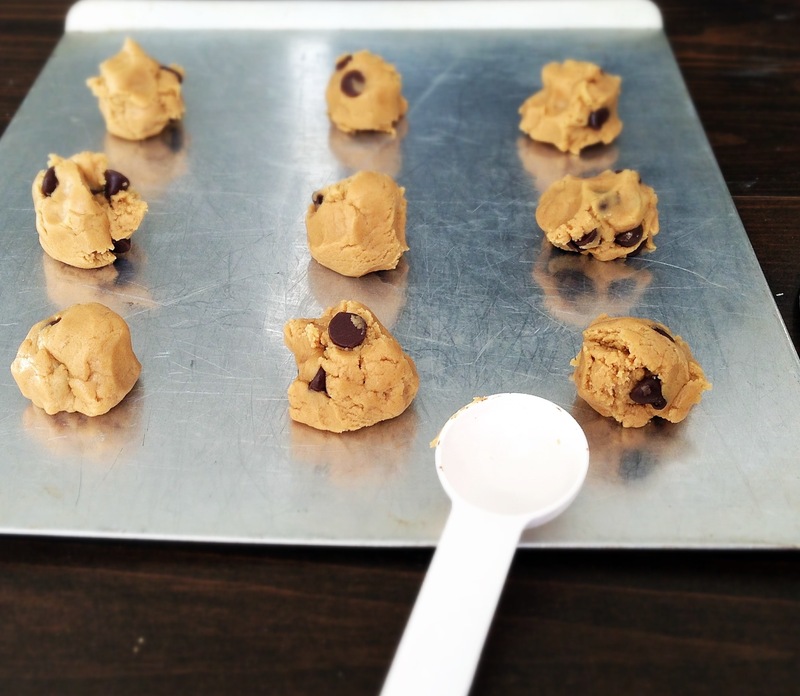 Drop cookies onto baking sheet using a tablespoon to measure. You can smoosh the cookies with your hands or mold them into balls if you like. Bake for 7-9 min. 8 minutes is perfect for my oven and the size I bake, but it may vary based on oven and cookie size. ** The cookies will be soft and a will look a little underdone – but will cook a little more as you let them cool on the sheet. Do not over bake. The cookies will come out hard and crumbly if you bake them too long. Cooled cookies keep for a week in a sealed container. Dough freezes well up to 3 months. You can also refrigerate the dough for up to ~ 3 days before baking. * I used a mixer because I have one. But you do not need any mixer to make these cookies.